World News -- VoaNews.com: Will US Military Complete Planned Troop Cuts in Africa? VoaNews.com: Will US Military Complete Planned Troop Cuts in Africa? Gen. Thomas D. Waldhauser, left, commander of U.S. Africa Command, is joined by U.S. Ambassador to Senegal Tulinabo S. Mushingi, right, after a tour of Camp Cisse where the U.S. The commander of U.S. forces in Africa has cast doubt on whether the Pentagon will complete plans to cut forces in Africa by 10 percent as the Department of Defense announced late last year. In November, Pentagon officials said they would cut roughly 700 of the 7,200 U.S. troops on the African continent. The reductions, officials said, were to "optimize" special operations forces that would be needed in a potential future fight against near-peer competitors like Russia or China. 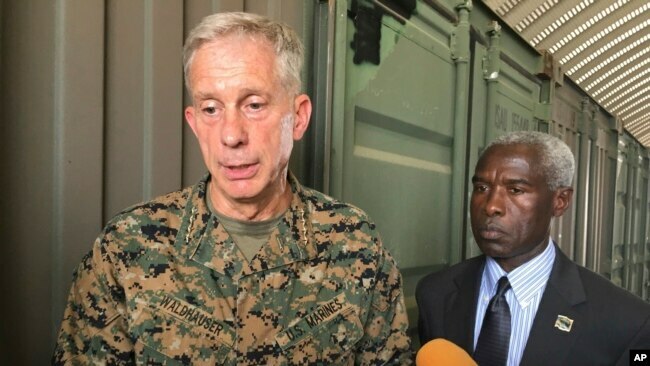 Marine Gen. Thomas Waldhauser, who heads U.S. Africa Command (AFRICOM), told lawmakers Thursday he already has reduced force numbers in Africa by about 300. But commanders appear to be rethinking plans to cut an additional 400 troops from the continent. "Whether we'll ever be directed to execute the second half [of cuts] is to be determined," Waldhauser said. The troop reductions were planned even though many West African nations are fighting insurgencies by al-Qaida-linked groups. Niger and Mali are battling al-Qaida-linked militants, and Chad is combating a militant push from the expansion of Islamic State and Boko Haram in neighboring Nigeria. Burkina Faso, host to a U.S.-led counterterrorism exercise last week, is facing "an unprecedented humanitarian emergency" due to surging terrorist attacks and intercommunal violence, the United Nations warned Tuesday. "The threat is growing," U.S. Ambassador to Burkina Faso, Andrew Young, told VOA in an interview. "We're in a tough fight, and the fight is getting harder." Waldhauser said he had advised the secretary of defense that AFRICOM was prepared to "push back" on the planned cuts if they are not in "our best interest." "Especially in Western Africa ... we are concerned. So far, there has been minimal impact," Waldhauser said. "If the groups grow, we may have to revisit these decisions." The general explained that the "optimization" cuts on the African continent were focused solely on the counterterrorism strategy. "It's a very small niche," he said. But this "small niche" of special operations forces and their enablers is a very important one. Local partners at the counterterrorism exercise in Burkina Faso told VOA their troops rely on these forces for help with everything from logistics to intelligence-gathering against militant threats. U.S. Air Force Maj. Gen. Marcus Hicks, head of U.S. Special Operations Command Africa, has cautioned that the United States and others interested in a secure and prosperous Africa should watch the Sahel "very closely" and "continually reassess whether or not there are enough resources applied." "I wouldn't recommend we decrease forces at this point. I think we have a good approach in this region, and we are stable with our force structure here," Hicks said in an exclusive VOA interview last week. Waldhauser explained Thursday that the cuts to U.S. forces in Africa have fallen mostly on places where U.S. troops had been training partner forces "for quite some time," and those partner units were now working on their own. But when asked by a congresswoman whether he feels "angst" due to withdrawing forces from areas in West Africa where there are still problems with violent extremist organizations, Waldhauser responded, "The short answer to your question is yes."